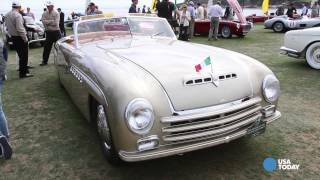 A Pinin Farina one-off car driven by Battista “Pinin” Farina in a tour of shows and concours in 1946 and subsequently his personal car. For Alfa Romeo, the 6C 2500 was the swansong of its era. When it debuted in 1939 as the third series of Vittorio Jano’s legendary inline six-cylinder Alfas, the engineers involved could never have imagined that it would signal the end of the line for hand-built Alfa Romeos. Thanks to engine upgrades and a vastly improved fuel delivery system, the 6C 2500 was the first road going Alfa Romeo capable of 160 km/h. Additionally, it benefited from four-wheel independent suspension, with parallel trailing arms and coil springs in the front and swing axles with torsion bars at the rear. Alfa Romeo continued its tradition of offering several levels of tuning, starting with the 87-horsepower Turismo, moving up to the 110-horsepower Super Sport, or SS, and culminating in the track-ready Tipo 256 with 120 horsepower. The 6C 2500 was immediately met with praise and success from its hand-selected upscale clientele. Alfa Romeo was, of course, still in the business of providing rolling chassis to custom coachbuilders, even as the onset of war loomed. The first project created after war’s end was the factory-offered 6C 2500 Freccia d’Oro, which had essentially the same running gear as the pre-war 6C 2500s. In the post-war years the demand for bespoke coachworks was very high and probably more than fifteen Italian coachbuilders built special bodies to clothe the important Alfa Romeo 6C 2500 chassis. The chassis of this Alfa Romeo originates from the year 1942 while the body of the elegant convertible was only styled at Pinin Farina in 1946. This car was commissioned by Giuliana Tortoli, a wealthy woman from Milan. Pinin Farina had 28 chassis’ delivered from Alfa Romeo during WW2 as part of his war time contracts. 14 were delivered in 1942 and only 6 of those survive to present day. Chassis 915169 was one of these and it was used to craft this one-off car with the cooperation of Pietro Frua. When completed it was taken on a tour of shows by Pinin Farina himself. Battista “Pinin” Farina personaly drove the 6C from Turin to Paris for the Salon de l’Automobile de Paris and his son Sergio followed in a Lancia Aprilia. After the fifteen-hour journey and a good clean, both cars were boldly parked in front of the entrance to the Grand Palais so that they would be seen by every visitor coming to the motor show. After the war, Italian cars were initialy excluded from the show and Pinin Farina was only given space for a stand at the subsequent motor show. The Alfa Romeo was then dispayed at the Exposition de la Mode Italienne in Lausanne, Switzerland and at the Concorso d'Eleganza dell'Ente Moda in Torino, Italy where won the prize for the best open car. The following year at the Concours d’Elegance de Monte Carlo, the car was judged and it received Grand Prix d’Honneur. The car was later repurchased by Battista “Pinin” Farina who used it as his personal car and by Austin Motor Company Ltd in order to use it as the basis of the design for the Austin A-90 Atlantic. Another famous owner was the designer Koto “Bob” Holden part of the staff of the famous designer Raymond Loewy, who was involved in a first restauration of the car in United States. In 1951 the proud owner displayed it at Indianpolis Custom Auto Show.